The hairpins known as Kondakoora emanate from Sri Lanka, formerly Ceylon. Often erroneously described as Mughal or Turkish turban pins, they were traditional to the low-country regions of southern Sri Lanka, as opposed to the hills of the Kandy region, where they were worn by wealthy women to secure the chignon. 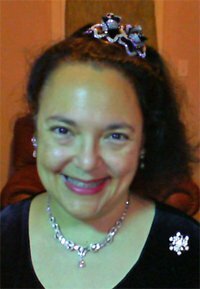 Positioned horizontally through the bun allowed the bejewelled finial to be clearly visible and sparkling; a fashionable accessory from the late 18th to the early 20th centuries. 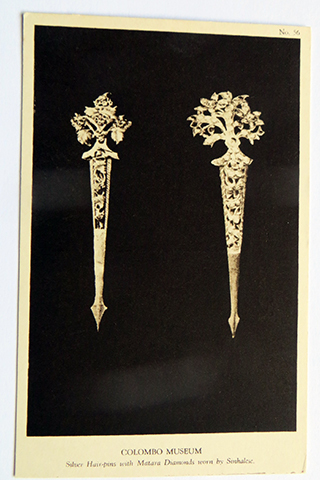 Kondakoora pins were generally made of silver, brass or gilded metal. From an arrow point at one end, the relatively flat shaft extends to an ornate, tear-drop or boteh-style finial of pierced foliated openwork enriched with gemstones, the embellishments continuing down the upper portion of the shaft. The finial is slightly angled back from the line of the shaft. The most typical examples were set with faceted white zircons known as ‘Matara diamonds’, sourced from the region of Matara, a seaport on the south coast of Sri Lanka not far from the more popular town of Galle. Occasionally gemmologists in Britain refer to a white zircon as a ‘jargon’ or ‘jargoon’, a popular term used in Georgian period jewellery. Besides zircons, some pins were set with moonstones, others with pink or blue sapphires – which were not rubies as is often supposed, as rubies were not indigenous to Sri Lanka. Occasionally they were set with faceted polished steel studs. Dimensions vary between 3 – 5 ins (7.5 – 13 cm) in length. Less often encountered are the kondakoora made from tortoiseshell. These simpler versions were of the same overall shape as their metal counterparts but lacked any further embellishment save for some pierced designs on the finial and shaft. Yet another variant of kondakoora was formed as a straight or rod-like épingle, without the ornate boteh finial but displaying the arrow-like end point. Either of gilt metal, silver or brass, the exposed upper portion was decoratively chased in traditional patterning. 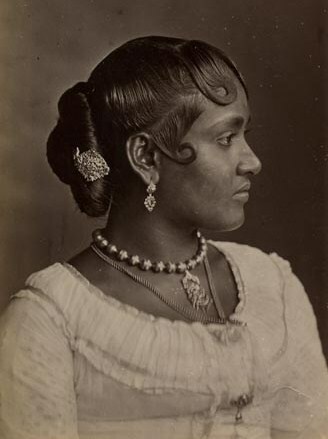 By the turn of the 20th century, fashions among the coastal Ceylonese women were changing and the traditional kondakoora pins eventually lost favour and were put aside. Many found their way to northern Europe, England in particular. 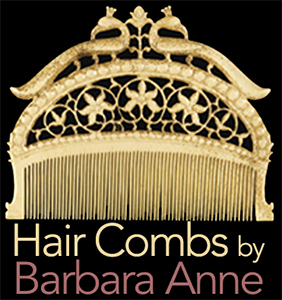 Converted to either brooches or traditional hairpins by the attachment of suitable devices, they re-emerged as a new vogue in the first half of the 20th century. Whilst the majority of the silversmiths and jewellery makers on the island were Tamils, some migrated from Sri Lanka to the Malay Peninsula in the 19th century, where they made jewellery items for local Straits Chinese clients. Overtime, the creative Tamil art integrated with the local skills and inevitably cross-fertilisation of styles evolved. As a result, it is not always easy today to discern whether some items are Sri Lankan or Straits Chinese in manufacture. Displays of Sri Lankan kondakooras are exhibited in such museums as the British Museum in London, the National Museum of Colombo in Sri Lanka and the National Negara Museum of Malaysia.